Birthdays are always special, but your third one is one you will probably always remember. Nothing beats the joy of being three! Travelling Light? – I don’t think so. 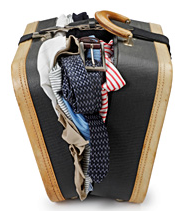 Never ever believe that you know better than your wife – especially when it comes to what is going in your suitcase. It doesn’t matter what you do – you will be a beast of burden.